Gosh – what a weekend. First the TES and then the Daily Mail. For the record, behaviour has been an important area for me since joining Highbury Grove but, by no means the only one. We’re also working on our curriculum and pedagogy, building a strong trust culture across the staff, exploring research-engagement, changing our professional review systems to take out data targets and the fear of PRP ; using the ideas embedded in the Trivium to shape learning, creating a Baccalaureate-style post-16 model, building the Sixth Form, tackling homophobia – amongst other things. You can see the whole school development plan here, just to get things in perspective. 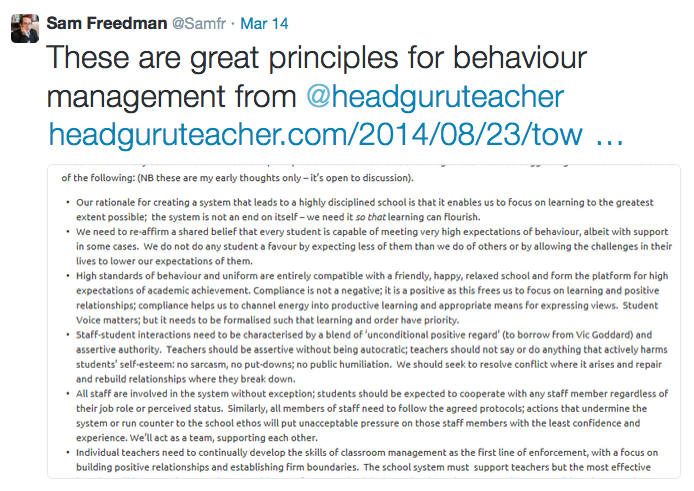 I wrote about our ideas about behaviour just before I started : Towards ‘Impeccable Behaviour’. Together I’ve set out some principles for a behaviour system – stressing that the system isn’t an end in itself; we need it so that learning can flourish. I was delighted that Sam Freedman picked up on this on his twitter feed. In January I wrote an article for the TES – they asked me to write something and this seemed like a good story to tell. It throws up all kinds of issues about school culture, what we mean by standards, how schools need to work with a diverse community of students and parents and how systems need to have a certain spirit. I tried to capture some of that, including the pain barrier we’ve been through to make improvements. I was being honest and open – why be anything else? This included a reference to the need to bring parents onside including someone (one person) who felt a detention was ‘Orwellian’. When the article finally came out on Friday I was horrified. The headline twists the emphasis in a radical way: ‘How my school came to love Big Brother’. What?? A sub-heading further on reads: ‘Surveillance Culture’ and the magazine has a large jokey image of a security camera on someone’s head. Ha-bloody-ha. So – you can’t even trust the folk at the TES to treat a sensitive story with a bit of respect. Yes – I know. Doh! How naive. For the record – we don’t have a surveillance culture at Highbury Grove; the detentions are not Orwellian – there is nothing Big Brotherish about our behaviour system that we have come to love. That’s not how it is. We’re explicitly trying to show our students how it feels to inhabit a world where ‘impeccable behaviour’ is real – so that they learn to be self-disciplined, motivated learners. The initial wave of detentions dropped within a couple of weeks; we’re at a new equilibrium point now – preparing for the next push where standards will rise further still. Slowly, steadily, sensitively with love and care. The whole thing is cast as the story of a Super-Strict Headmaster transforming an unruly school by dishing out detentions. It’s all very….. Tabloid! Some of my friends and colleagues love it. They’re saying ‘well done’. But I’m not relaxed about it at all. It is pretty weird to read our story as told to please the Mail Mafia alongside the recipes for ‘menopause muffins’. For the record, Highbury Grove was not an unruly school when I arrived – there were difficulties; standards needed to improve but ‘unruly’ suggests something else altogether. Behaviour has improved for sure – but the idea that things have been transformed isn’t accurate at all. We’ve only just started – and we’re building in a sensitive way towards a culture of learning that anyone would embrace. Reading the comments below the Mail Online version is eye-opening. I’ve never experienced anything on this scale before – polarised views of what we’re doing thrashed around with all kinds of assumptions made about me and my motivations: eg ‘I bet Christmas is fun in his house’, ‘big man picking on little children’, ‘In North Korean it’s called dictatorship’, – and apparently I’m a power hungry careerist. Strewth. On the other hand, the supportive comments dominate – albeit in a way that reinforces the idea that we’ve introduced some kind of oppressive regime. For some, I’m the new age Rhodes Boyson, just a cane short of the real deal. Well – for the record – Highbury Grove doesn’t feel like that I can assure you. There seems to be no room for nuance in the way this story is told! And since when was a strong discipline policy the preserve of Right Wing thinking? All of this goes to show how difficult it is to walk the line. It was probably a mistake to write the article. Reflective posts on my blog clearly don’t translate to a mainstream publication; there is a price to pay. Lesson Learned. I’m so much more interested in what the school actually is than what it sounds like or looks like from the outside but there’s a risk that the message is getting distorted. Right now I’ve also got a fairly major responsibility to deliver on the National Baccalaureate; that’s hugely important to me and all of this Noise is a distraction we don’t need. I’ve got work to do. So, no drama, but I’m considering shutting down for a while so that I can focus on my school a bit more privately. 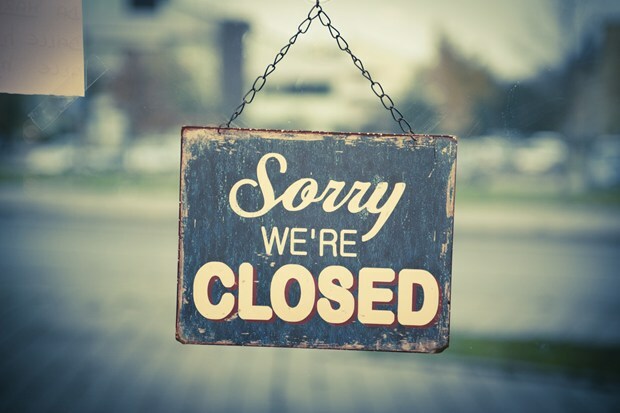 I’ve got a huge backlog of posts to write and lots to talk about and share but for a few weeks at least I may need to do the day job behind closed doors. It’s just too hard to manage the message. I might hang one of these up (metaphorically – obvs). Knowing me, it won’t be there for long. « Parents’ Evening = Teacher-Appreciation Night! You and your team are working tirelessly to improve and enrich the lives of young people, and succeeding. It must be disheartening, but try and ignore the menopausal muffin munchers and move on! Tom, you are in the right place, at the right time doing the right thing….KEEP GOING!!! This is true leadership indeed. Unfortunately history tells us that being right does not always guarantee success but I believe you have the support to win the day. Good for you and you have my respect. Sadly, there can be no reasoned debate in the public domain about schools and education in the current election-fevered media free-for-all – but what’s really depressing about this is the TES’s falling standards. I long since ceased to read it for truly informed debate. Good luck with your work on the National Baccalaureate! Don’t stop blogging for long. we (teachers) need some one with authority and influence to point out the ridiculousness of some of the current going-ones in schools. Can’t believe the TES would do that to you Tom. Sod ’em! This is quite unbelievable. If it’s any consolation I sure you have the support of every professional working to further improve the lives of children. You certainly have my respect. Hi Tom: you once asked in one of your many blogs what, if there were no OFSTED, teachers would do in their schools and classrooms. You then advised us to do just that, even when they did come. The Daily Mail and its readers matter far less. Controversy and hatred are what the media thrive on, as I’m sure you know. So take your own advice, and do what you would have done anyway, with the same conviction you had, and with the backing of God knows how many teachers across the country who admire the work you’ve done. I know what you mean. The problem with newspapers is that they have a very different perspective than we do, who actually work in schools. Their main priority is to sell copy, and they need controversy and sensational headlines to do it. I love my little blog. I can say what I want to say – you would think that that would be that, but I am always interested by other people’s interpretations. Anyone with something strong to say comes in for a bit of it – I consider myself lucky that, so far, as a member of the Down’s syndrome blogging community, I haven’t. I’d be sorry if you stopped blogging. Had a friend who was breeding dogs and as she went to clean out the enclosed area the puppies were in one morning she caught sight of a small photo of me in the newspaper she was screwing up. (I’d commented on the value of A level versus IB for one of the daily broadsheets). Ever since then I’ve always thought today’s news is tomorrow’s puppy poop. Sorry the TES let you down, would have hoped for better from them. Keep doing what you and your staff believe in, It sounds good to me. Best of luck with the National Baccalaureate. Let me know if j can do anything there. Creating a calm and purposeful school can’t be bad, surely. Don’t take the snipes personally. People don’t understand each other’s contexts. If a politician’s kitchen can cause a media storm, there’s no accounting for what interests people or what is really felt to be important. Hmmm, now thinking twice about my own tes article which is to be on a similar theme. Part of me thinks ‘stick to what you know is right for the pupils’ and another ‘we don’t want some sort of backlash just for doing the right thing’… Still, I’m not SMT, so they’ll decide if they want me to go ahead or not. Tom, it would be a real pity, especially in the run up to the election, if your communication ceased. If we don’t have people that really know what it’s like, writing the truth from the heart, then who will fill the void? The strength of your argument and conviction will win through. Don’t know how best to support you, but you have my support. What terrible copy – this suggests you saw *too much* discipline and immediately set about reducing discipline back to acceptable levels. I assume they mean you clamped down on sub-par behaviour. Please don’t stay away for too long.. We will miss you. You are our voice and I’m sure I speak for many of us. Wow Tom, it is sad the way your words have been twisted – this is the second time? Your blogs are great, don’t stop writing. I have learned so much from you, and you are truly inspirational. Even the fact that you find time to share your thoughts and knowledge is amazing. I hope all goes well and look forward to hearing from you again. Inspired by you ‘old hats’, I have just started blogging. It is simple behaviour advice for beginning teachers and it is so far well-received but it scares me, reading your post, that I might wake up to comments that skew my views. I am prepared for debate and discussion but not for what you have faced this week. It is professionally damaging and personally upsetting but, what they don’t realise when they write a headline, is that it is more damaging for the students who read about their school (the place in which they belong and have an understanding of) from a different perspective. It is destabilising. Especially some of our students who believe the printed word and have not yet developed the skills to question the media. I suppose we just need to hope they don’t read the Mail. The sharing you and others do is the unofficial driving force in our current ‘School Led System’. I am certainly led by the practice of others, with Twitter and blogs fast becoming my most-valuable CPD. Maybe this is not something that can be translated into popular media (even the TES) and maybe teachers’ ‘naivety’ that newspapers will want to help in this sharing of good practice means that the two should not meet. The most important thing is that your staff and students benefit from your leadership and that other schools, leaders and students do not have to waste learning time developing their own strategies when tried and tested ones already exist. A couple of silly headlines doesn’t change this. Hopefully we’ll all be reading new posts soon. I read and retweeted the TES article, Tom, and thought that, other than slightly misleading headlines (as headlines often are) it was quite balanced and constructive. The Mail is a different thing altogether. Interestingly, a couple of years ago The Mail published in one edition two stories about two people I knew – one a girl (former student of the school where I was a head) who had died in unexplained circumstances. Because I knew the people and the facts of both stories I was horrified by how they’d been distorted in order to make the reporting sensational. I still think of the parents of the girl who were dealing with this terrible tragedy and having to contend with misleading reporting in a national paper. I haven’t read a Mail article since. The media is an interesting animal. I learnt a lot about it in 2009 when I was President of the Girls’ Schools Association and saw how things can be taken out of context, sometimes deliberately manipulated, and sometimes inadvertently. It is something you have to rise above, I think. We do the right thing because we know it’s the right thing to do, and if we’re misrepresented or unfairly criticised we can’t let it derail us. Unfair criticism kind of comes with the territory in headship anyway, I think! So the real damage would be if you did go to ground, stopped sharing (with your typical honesty and openness) your insights, which so many teachers and leaders find invaluable. Don’t let them grind you down, Tom! Perhaps uniform standards were higher at KEGs because the kind of parent who can afford to hothouse someone through the 11+ is unlikely to have any problems affording uniform? Some may not have their top button done up because they have grown and are wearing an ill-fitting shirt. It might sound ridiculous to someone on a professional salary but uniform can be a significant outlay if you have multiple children at the school are being whacked by punitive govt welfare “reforms” at the same time. I’m all for high uniform standards but is there a hardship fund and is it well signposted? Please, please, please don’t stay closed for long! Anyone who subscribes to your blog or has heard you speak in person knows you are the real deal. You are a supportive voice in our Twitter community and everyone has a lot of respect for your principled approach to all aspects of school leadership. Good luck in riding out the storm and hope to see you blogging again asap! This really isn’t the time for people to be taking advantage of the situation to increase the number of hits to their own blog. Well the data is in, I believe I got a total of 2 hits from that link. Still think it counts as “taking advantage”? My brother has just been through the Daily Mail / general media wringer. It’s crap but temporary. Best wishes. I stopped reading the TES fifteen years ago because of their incredibly biased and distorted representation of schools teaching phonics, and of the evidence for phonics. For years they simply refused to give a platform to anyone in favour, and took every opportunity to rubbish phonics teaching. They have always had an editorial line that is largely against anything that smacks of “traditional” teaching, and you have now, sadly, come up against this. I know you have tended to feel the progressive/traditional debate is exaggerated, and if you are only looking at secondary teachers’ opinions, that is a reasonable view. But the reality is that there are a lot of influential “educationalists” out there who are not teachers, but who really will get the knives out for anyone who doesn’t toe the “progressive” line. And they won’t be fair or reasoned about how they do it.